Installation of the PoolGobbler Pro is easy and quickly done - Site de 1517492982 ! 1. Assembling the PoolGobbler is easy! 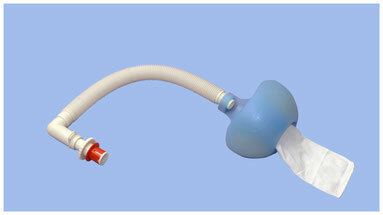 Slide hose C over elbow B and the floating head D, and push until it clicks. 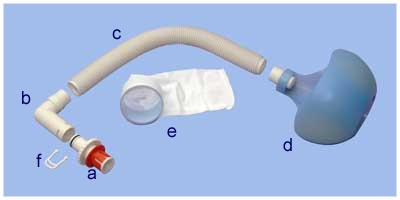 Then slide the holder E with the filter bag into the floating head D, from the inside to the outside (on the picture from left to right). Connect the universal connector to elbow B and secure it with clip F.
That's all, no tools needed! Your PoolGobbler Pro comes with a clear User Guide. 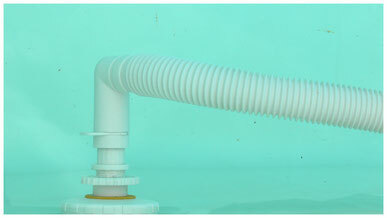 Remove the cover from the inlet onto which you want to connect the PoolGobbler Pro. Put the cover back onto the inlet. Insert the universal connector into the opening in the cover and fasten it by turning the big white wheel. The teeth of the connector will spread and thus fix the PoolGobbler in the inlet. That's all, you see : simply set it and forget about cleaning your pool ! You can now sit back and watch the PoolGobbler do your work.